SUMMARY: Brick-sized treatise on the mechanics of genes on population dynamics and trait expression – in (nearly) everyday language. AUDIENCE: A classic must-read if you’re remotely interested in biology –> zoology –> understanding genes AND if you enjoy complex, subtle and far-reaching theoretical speculation into evolutionary dynamics. REVIEW: Richard Dawkins is an evolutionary biologist with out-of-this-world theoretical insight into anything and everything he puts his mind to. In this book, he meshes the works of Darwin (evolution), Trivers (game theory), and Mendel (genetics) into an intuitively appealing and internally consistent model to expose the mechanics of genetic inheritance. Group selection –the idea that whole groups of animals, like an entire species, strive for common success. 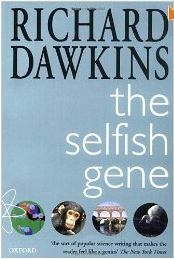 The crux of the book is this: Dawkins proposes a daring conceptual shift from the entire organism to the individual gene as the fundamental unit of hereditary selection. He briefly introduces (re-introduces if you’re a biologist) the nitty-gritty of molecular genetics, but quickly moves on to illustrating his points with one fascinating evolutionary example after another. One of our lecturers warned a room full of neural scientists, behavioural psychologists and veterinary doctors that it would be a tough read for most of us. I can’t decide whether she’s right, as my background is Zoology (so slap in the middle of his subject matter). From what I recall, though, I found it reasonably jargon-free. In terms of complexity, he does go off onto mindbogglingly sophisticated flights of theory — with a couple of beautiful chapters on game theory to name but one topic. So fasten your seat belt, because, intellectually, this is a Ferrari of a book. But if you’re up for the challenge, it will (at worst) stop you from blurting genetic stupidities, and (at best) revolutionarize your understanding of life, the universe and everything. This book is a all-out classic, and it is one of the must-have intellectual gems of the twentieth century. Go on. Try it. Browse the Book Review archive. Genre: pop science. Author: Dawkins Richard. Reading Level: Academic. Star: 5. Bookmark the permalink. Post a comment or leave a trackback: Trackback URL.